Do you need garage clearance in Loughton IG10? 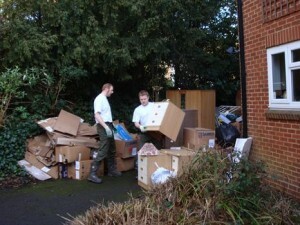 We supply garage clearance Loughton home owners consistently rate highly and are happy to refer. They appreciate us for our quick, versatile service and economical fees. We think you are going to too! We are registered waste carriers. You can rely upon us to do an entirely professional job and deal with all your waste responsibly and within the law. We are a local company and we work 7 days a week from 7am to 11.30 pm so if you need an early morning, evening or weekend appointment that’s not a problem. We offer a speedy, same day collection service. Whenever you need us we are standing by. Reservations are made in two hour slots and we’ll always call ahead of time to let you know when we will be arriving. So you won’t be left wasting time and can get on with your day. Our clear pricing means there won’t be any unpleasant surprises when the job is finished. The price we quote is what you will pay without any hidden supplements. We always sweep up when we’ve finished clearing your waste and leave your garage neat and clean. 80 percent of the rubbish that we remove is recycled. To speak to a member of our knowledgeable team about your needs for garage clearance Loughton just phone us on 0208 504 7390 or 07957 123019. We’re right here 7 days a week to answer your call and will be able to address any queries and come up with a very competitive quote that’s inclusive of all labour, transportation and disposal fees. Or, tell us what you need using our online request a quote form and we’ll respond fast.